What does it mean to cede control to the Divine Other? 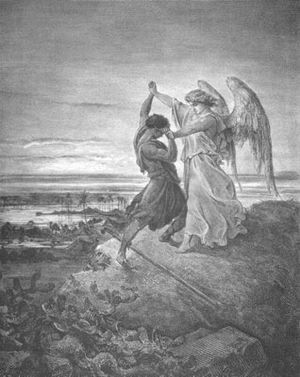 This is the question I didn’t address in this morning’s harangue based partly on Jacob’s nocturnal struggle with a mysterious strong man. The surrounding saga yields context and meaning to this particular encounter in Jacob’s journey, but it gives pause to consider what is meant by “letting go and letting God.” Is this oft heard injunction the most helpful to grow by? Jacob needed release from the tentacles of deception of self and others if he was to thrive. He needed to confront his wound, acknowledge and accommodate it in order for it to become an internal resource by which he would understand a new way of perceiving himself and others. This kind of release can only come with pain and struggle – and it was a long one that lasted all through the night. What if Jacob had “let go and let God” or otherwise ceded control? I wager the result might have been quite different – he could have remained as wimpy and as deceitful as before. Oh – and here’s a handy glossary for cyber-newbies and veterans alike. WordPress, the patron of those of us who consented to be locked into writing something on our blogs everyday for 2011, suggests a range of tools that help prevent being disturbed while writing: Distraction Free Writing | The Daily Post at WordPress.com. I confess my distractions are not of the nature described in the article – buzzes and tweets and visual clutter on the desktop, whether virtual or “real life”- this external clutter I can deal with (usually by just ignoring it). I’m more likely to stray from the task when a fleeting thought invites me to follow it through the labyrinthine caves of my right hemisphere, which is replete with other inviting thoughts and images – so that even my internal distractions are interrupted with more of their kind. This makes concentration a continuing challenge and it’s one of the reasons the daily post presents itself as a quest – an internal discipline that is different from the other task-oriented disciplines that my daily work calls from me. Critically reading back over some recent posts I can see the results of the above described phenomena of chasing interrupted distractions. I can hear my Form 8 English teacher saying “Ryle, you’ve got to develop your ideas more and provide a proper ending!” Funny thing is, I seem to be able to attend to this need in the didactic and exhortational tasks I’m professionally trained for, but not when I’m in free fall. It’s wet and windy in Perth today – good Cornish pasty weather for this bloke with some Cousin Jack in his veins. 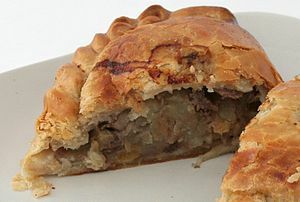 I saw a news blip that says that in the EU the name “Cornish pasty” can now only be given to pasties created in Cornwall. This made me wonder what alternative nomenclature could be given to pasties made to the same recipe beyond the boundaries of that southern part of the UK. My current supplier (apart from when my beloved makes them) is a little café not far from here, certainly half a world away from Cornwall and 2000km from Australia’s own “Little Cornwall” where my forebears arrived in 1853. Nothing but the name “Cornish pasty” evokes the taste, texture and satisfaction of this sumptuous savoury. One enjoys not only the eating, but the legend of the miner’s “edible lunchbox”, complete with throwaway handle. Some versions of the pasty even contained two courses – the traditional meat and veg at one end and stewed apples and custard at the other! Now I’ve talked myself into one – can’t wait for lunch! Empathy in Norway – Eureka Street. As the shock of the Norway massacre begins to wear off, we look for discussion that is reflective rather than knee-jerkingly reactive. I’ve found this essay a helpful place to begin – as much for the comments section as the main piece. The burden of the discourse carries a warning of what happens when ideologies of any kind create generalisations that negate the particularity of each human being. We turn people into objects of admiration or vilification. Either is an action that dehumanises, reduces and devalues the uniqueness of one another. The discussion carries both a warning and a call to something better. Decisions are discovered not made! This enticing thought comes from Native Wisdom for White Minds by Anne Wilson Schaeff. It certainly challenges our linear mode of thinking. We seem to be very left hemisphere dominant, treating anything from the right side of our grey matter with undue suspicion. Might there be a synthesis? By the end of Genesis, one could be forgiven for thinking that the Divine only favors scoundrels. 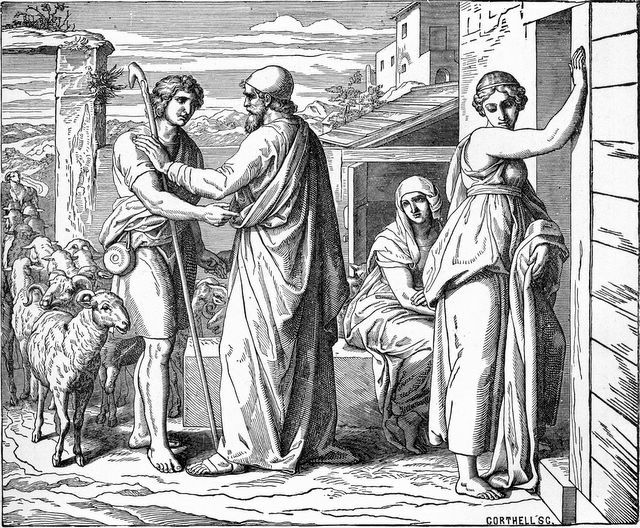 Jacob, already a fugitive from the consequences of fraudulent behaviour in impersonating his brother, Esau, is outdone by his prospective father-in-law, Laban, who passes the less desirable daughter, Leah, off as the promised bride, Rachel. Ultimately, Jacob scores both, so he and Laban can congratulate each other in their mutual trickery and call it a day as far as kicking off one of those interminable family feuds. This is only the climax of a great intra-clan drama that has unfolded over the middle 23 chapters of the first book of the Bible! Dig further back for scandal, intrigue, one-up-manship, near infanticide and cruelty since Abraham began his great journey. Yet the overall message seems to be that a Divine plan is unfolding through this whole morass of misanthropy. A conundrum for those of us who defend the inspired nature of the holy text and also for those who dismiss the Genesis narrative as fairy tale. Neither party can fall back onto some idealised vision of human nature – because there it is – in your face – full and rough and gutsy! On the strength of these stories the Divine might have abandoned this universe long ago – but the testament is that not only the presence, but the purpose, of the Holy One is to be discerned in the unfolding drama. Nothing to say … just deep silence for the victims of violence and famine. This article illustrates well the burden of my post yesterday: Consumers rule in Murdoch’s evil empire – Eureka Street. We (the general public) have far more access to the tools of journalism than we used to. No matter how amateurishly we wield them, the results carry great impact – for good or ill. The birth earlier this year of the Arab Spring with all its risk and promise was largely eased by popular access to Twitter and the web. For the first time, there is a hint that power is capable of shifting from despotic rule to the hands of the people. I sat up way past my bedtime last Tuesday morning to watch the Murdoch appearance before the British parliamentary committee, and I concentrated hard on the content of the line of questioning and the answers. To read the next morning’s papers, however, was to be led to the belief that the only thing that happened of substance was the foam pie incident. Pundits suggest that it was the immediate prolific tweeting of the so-called “Twitterverse” that swung editorial decisions to focus on this “exciting” piece of vaudeville rather that the boring and exhausting detail of history in the making. We, the public, it appears, got what we deserved. Of course, there are a range of sources from which to gain the detailed journalistic analysis that we might seek. But so much sand to sift to get to the gold! In the meantime, public opinion is swayed and shaped by the banal and deliberately inaccurate (think Australia’s current carbon tax debate).